DRLM is a Centralized Management Open Source solution for small-to-large Disaster Recovery implementations using ReaR. Is an easy-to-use software to manage your growing ReaR infrastructure. Is written in the bash language (like ReaR) and offers all needed tools to efficiently manage your GNU/Linux disaster recovery backups, reducing Disaster Recovery management costs. ReaR is great solution, but when we're dealing with hundreds of systems, could be complex to manage well all ReaR deployments. With DRLM you can, easily and centrally, deploy and manage ReaR installations for all your GNU/Linux systems in your DataCenter(s). DRLM is able to manage all required services (TFTP, DHCP-PXE, NFS, ...) with no need of manual services configuration. Only with few easy commands, the users will be able to create, modify and delete ReaR clients and networks, providing an easy way to boot and recover your GNU/Linux systems through network with ReaR. 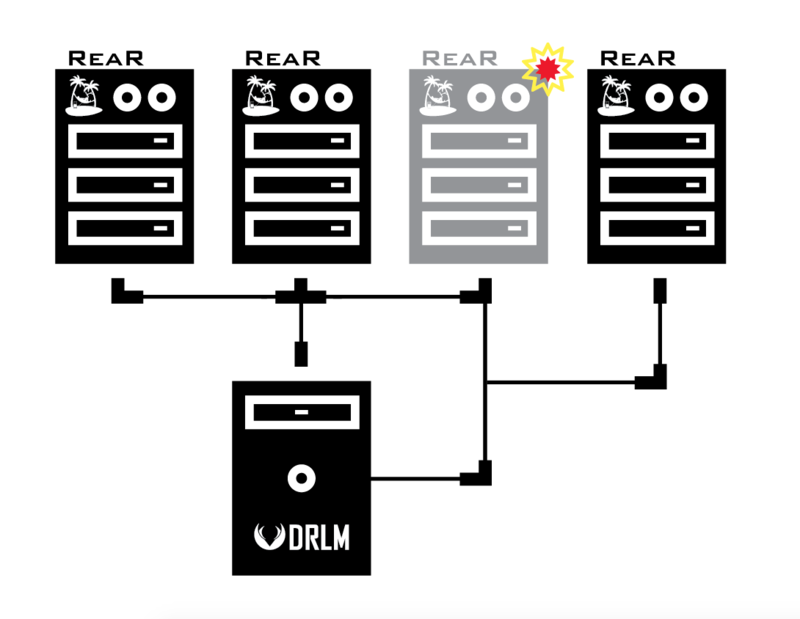 Furthermore DRLM acts as a central scheduling system for all ReaR installations. Is able to start rear backups remotely and store the rescue-boot/backup in DR images easily managed by DRLM. You can easily enable or disable the last or any previous backups to restore any client with a single command line. Currently DRLM supports PXE and NETFS(nfs) OUTPUT/BACKUP methods of ReaR, but the Development of DRLM non stops here, we are continuously working to improve performance, usability and more ReaR methods, in order to become, together with ReaR, the reference when talking about Disaster Recovery of GNU/Linux systems. For more detailed information about DRLM, please take a look at Documentation. Relax-and-Recover is the leading Open Source bare metal disaster recovery and system migration solution. It is a modular framework with many ready-to-go workflows for common situations. Relax-and-Recover produces a bootable image. This image can repartition the system. Once that is done it initiates a restore from backup. Restores to different hardware are possible. Relax-and-Recover can therefore be used as a migration tool as well.